I have to say I really love these new socks. I especially like how the cable turns out much more beautiful when it's a little bit stretched out. And the lace pattern is pretty too, even though it's so simple. 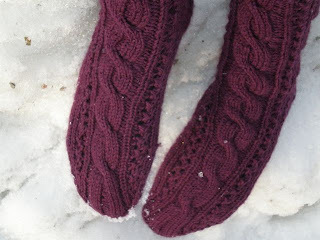 The whole pair of socks would have been a really fast knit had I only had the time to really sit down and work on it. Actually, the only think I'm angry about, is that my gauge was a bit different when knitting the second sock, so it turned out much tighter than the first one. I don't think you can see it that well, but I feel it very clearly when I wear them. I just hope the other sock will stretch once I've used it a bit more. I think the past two weeks have been the most stressfull weeks of my life so far. I've just been running from one place to another, following a tight schedule and counting minutes. The good thing is that I have lessons again, which actually gives me a chance to sit down and relax. I've brought a knitting project with me almost every time and I've noticed that it's much easier to concentrate on what the lecturer is saying when I at the same time have something to do with my hands. If I only sit, doing nothing at all, my thoughts just start wandering and thinking about all the things I should do. I don't know what the lecturer thinks about people knitting during his class, though. I don't know if he understands that I am in fact listening and not just killing time. However, I'm actually not the only one knitting. There's always one other girl who's kniting too. But while I've been struggling with my 2 mm needles, I've jealously been watching how her sweater keeps progessing so fast with her 6 mm needles. Oh, I miss working with thick yarn. With thick yarn and big needles you actually notice you're doing something. But with this thin yarn I have now, my progess was only some 5 cm during three lessons... if even that much. Sigh. But hey, you know what? Spring is almost here! Even though it's - 17 °C outside right now, the sun has still be shining and I've been able to feel the warmth from it. Only two weeks till March! Nå, som tur finns det ju ingenting som hindrar att du stickar ett par till av samma mönster! :) Jag rekommenderar nog varmt (haha) sockor i stället för benvärmare eftersom dom värmer tårna också. Åtminstone mina tår brukar alltid frysa så fort det blir lite kallare. Men inte i år! 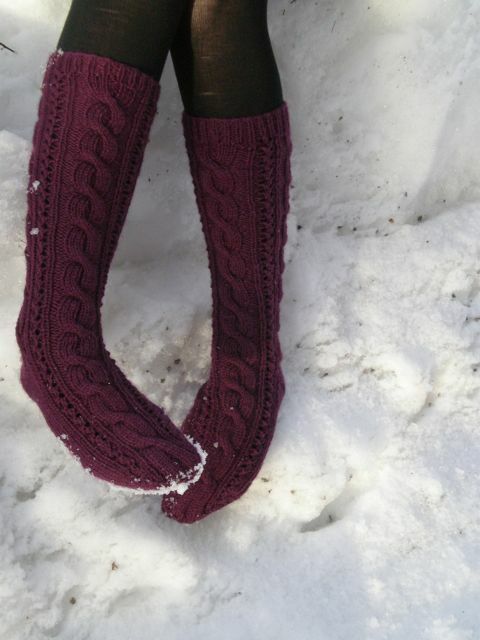 För i år har jag använt yllesockor nästan varje dag!